How did Aryabhata compute the earth’s circumference so accurately (less than 1% error) nearly a thousand years ago? In today’s age, “How far is the stream?” is an oft-repeated query that trekking and hiking groups brace themselves for from the newbies, before breaking into a wry smile. Then recounting an amusing anecdote, and watching the blood drain from the unsuspecting tyro’s face. The story, surely not common to a specific Indian culture or geography, roughly follows the same narrative. As the story goes, that one time, the group found itself disoriented in the middle of a hike on a hill in the hinterland, after being baked in the sun for hours.To add to the misery, they were dangerously low on food and water, dehydrated even. They somehow soldiered along in the receding sun, dragging their feet along the forest to find a lone countryman chopping firewood and doing his thing in the middle of nowhere. Ecstatic upon finding a human, they proceeded to ask him for directions. The farmhand assured them that they had to walk for 10 minutes in the same direction to find the most gorgeous stream abutting a jeep track; another 15-minute walk along the path would take them to the hamlet that everyone had told them about. All good, then. Except, to everyone’s dismay, they would reach the stream only at dusk, a full one and half hours later. The bigger question now stared them in the face: Exactly how far were they from civilization? In the annals of underestimates, the one made by Christopher Columbus perhaps ranks at the top. While the rest of Europe was busily preoccupied with the Portuguese efforts to encircle Africa en route to India, Columbus looked westward to achieve the same end result. He had even correctly taken the shape of the earth into account. However, he believed in the size of the Eurasian landmass according to inflated Greek estimates. Additionally, he failed to grasp the actual units used to calculate the earth’s size. The result? He underestimated the distance between Canary Islands and Japan by a factor of 80%, a distance that no ship of the time could have traversed. Luckily for him, he found another continent in his route to Asia. If Columbus arrived at such an error using European estimates, how did Aryabhata compute the earth’s circumference so accurately (less than 1% error) nearly a thousand years ago? As it turns out, our forefathers were quite curious and observant about the motion of celestial bodies like the sun, moon, stars and planets. Even though we accept the statements, “The sun rises in the east” and “The sun is directly overhead at noon” at face value, our ancestors had noticed the various patterns of apparent motion of these heavenly bodies. Both the sun and the moon are in continuous motion as seen by an observer on the earth; the sun and the moon cover a specific angular distance (1° and 13°, roughly) against a background of stars every day. That is not all. 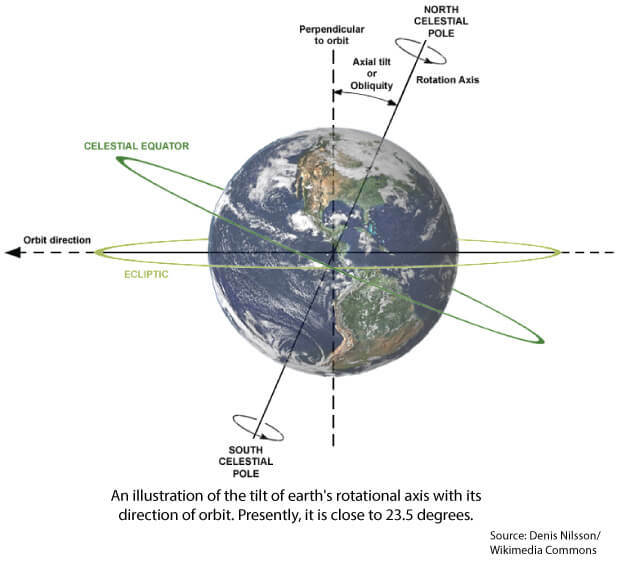 A special feature of our earth is the tilt of its axis (about 23.5°) with its orbital plane. They observed the differences in the directions between earth’s rotation and revolution. How did they manage to do all that? Well, if there were to be no difference, the sun would have risen and set at the same position each day and the duration of each day and night would be roughly similar all over the world. Instead, every year, the point of sunrise and sunset moves in a seesaw-ey, to-and-fro motion. For example, the sun was exactly east at sunrise on 20 March last year, the spring equinox. On this corresponding day every year, the duration of the day is equal all over the earth and the sun is exactly overhead at noon on the equator. For a person standing at the equator on this date, this means that objects will not cast a shadow at noon. From here until late June, the point of sunrise progressively shifts to the north (and correspondingly, the latitude of zero shadow at noon) until it reaches the northernmost extent on 21 June (the summer solstice) at the Tropic of Cancer. This also results in the length of day gradually increasing until it reaches a maximum in the northern hemisphere. Following the summer solstice, the sun begins its “southward” journey with a date on top of the equator on the autumnal equinox (22 September) and over the Tropic of Capricorn (22 December) before it proceeds to move northward again. Of course, this is written from the perspective of the observers in the northern hemisphere and these seasonal trends in the southern hemisphere are exactly reversed. 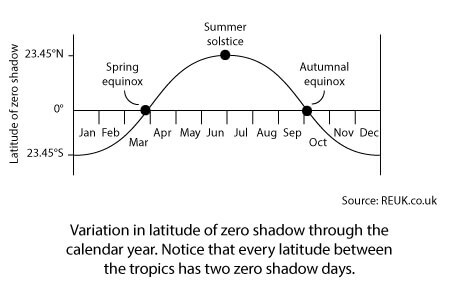 Therefore, for someone located between the tropics, the sun is directly overhead at noon twice a year; and on the tropics, it happens only once—on the solstice. These dates can vary by a day or two in the short term since the earth revolves around the sun in an orbit of 365.25 days, as opposed to the Gregorian calendar’s 365. Our ancestors kept track of these observations in order to sow seasonal crops and monitor reserves of food. Since the earth is nearly spherical (it is a little flattened along the poles compared to the equator), the geometrical properties along its surface are different to the traditional geometry that we know of. For instance, the shortest distance between two points on a flat surface is a straight line; on a spherical surface, it is a path along something called as a great circle. A circle drawn on a spherical surface such that it divides the sphere into two equal hemispheres is a great circle – you could visualize this as slicing a ball exactly into half, with the slicer passing through its centre, and along the two points. These great circles are useful in navigation since one can determine the shortest path between two points; they are also useful tools employed in astronomy and crystallography. Some of these concepts of spherical geometry can also be used to define the areas that we inhabit, just like a main road and a cross road system would define a particular intersection in a locality. Two types of imaginary gridlines were thus used to define a position on the earth’s surface: latitude, which specifies the north-south position, and longitude, which specifies the east-west position. 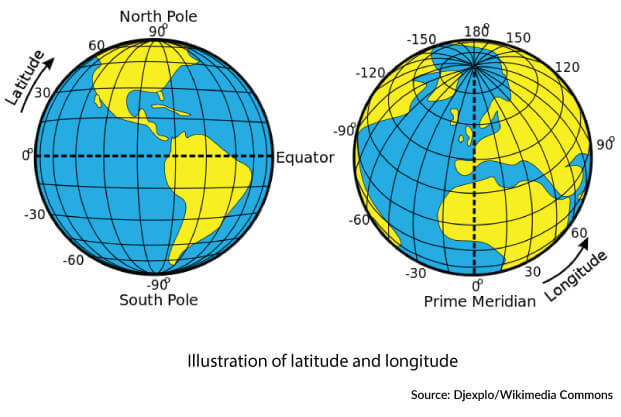 Longitudes run north to south from pole to pole, whereas latitudes run across. The crucial difference between the two is that while every longitude is a great circle, the only latitudinal great circle is the equator. Hence, the difference between two successive longitudes differing by 1 degree at the same latitude is maximum at the equator (about 111km), and gradually decreases to zero as we move towards the north or south poles. This shows up in maps with areas such as Canada and Greenland being grossly overestimated; the corresponding view on a globe shows their real size. However, regardless of the latitude, all points on a given longitude experience the same local time. Now that we’ve wrapped our head around middle school geography, we can now proceed to understand how our forefathers computed the earth’s diameter with astronomical observations. The first known person to calculate the circumference of the earth was the Greek astronomer Eratosthenes (as the legend goes, without leaving Egypt), during his lifetime between the 3rd and 2nd century BC. He observed the zero shadow at noon in Syene (modern-day Aswan) at the summer solstice and concluded that it was on the Tropic of Cancer. On the same corresponding day (presumably on another year), he measured the length of shadow of a known pole at noon in Alexandria and found that the angle cast by the sun’s rays that day was one-fiftieth of a circle. Since a circle has 360 degrees, all he had to do was to find out the distance between Alexandria and Syene, and he could calculate the earth’s circumference. While there is some debate regarding the actual unit of measurement used, the common estimates of error for his exercise range from 10-15%, a remarkable value for the time. Understandably, there were some errors in his measurement due to some of the assumptions he made. One, the earth is not a perfect sphere, albeit the scale of this error is only one-third of a per cent. Two, the two locations were not on the same longitude and hence it is likely that the distance measurements did not happen along a great circle. Three, the angle of tilt of the earth’s axis is not fixed but wobbles very slowly between 22 and 24.5 degrees (over thousands of years) and hence it introduces a small error in the measurement of the angle of the sun’s rays at noon. Using modern methods and Eratosthenes’ logic, an accurate value can be calculated. But this still does not explain how Aryabhata got it right since he would have had to encounter the same errors. In the seventh gitikapada of his seminal work Aryabhatiya (Aryabhatiya of Aryabhata, critically edited by K.S. Shukla and K.V. Sarma, Indian National Science Academy) and accompanying commentaries by Bhaskara I and others, the value of the earth’s diameter is given as 1,050 yojanas, which translates to 3,300 yojanas as the equatorial circumference (based on Aryabhata’s extremely accurate value of pi, 3.1416). The size of the yojana was not fixed as it was pegged to the height of a man or the width of a finger. Therefore, different astronomers used different scales of measurement. For example, Bhaskara II in the 12th century calculated the earth’s diameter as 1,581 yojanas (4,967 as the circumference). These were different numbers but the ratios between the different values used by these astronomers were consistent, suggesting that they had just used different standard units bearing the same name. Modern estimates suggest that Aryabhata’s computation was 39,968km (24,835 miles), just off the currently accepted value of 40,074km by an incredible 0.27%. All this may sound easy in theory, except when you realize that these remarkable calculations were made without the aid of an accurate timekeeping device (like a chronometer) or a standard unit of length (with the resolution in parts of a millimetre). The plot further thickens when you look up the works of astronomers during the Islamic Golden Age. Many of Aryabhata’s concepts and calculations found themselves a place in astronomical tables (or zij, in Arabic) of Persian and Arabian mathematicians. One of the problems that was the driving force for astronomy in the Islamic world was the finding qibla, the direction of the Kaaba in Mecca. It is the direction that Muslims face during salah, their daily prayers. A precise understanding of spherical geometry was necessary in order to orient sacred structures in the right direction, which required contributions from a lot of Muslim scholars of the time. One such astronomer, Abu Rayhan al-Biruni, also ended up calculating the radius of the earth. 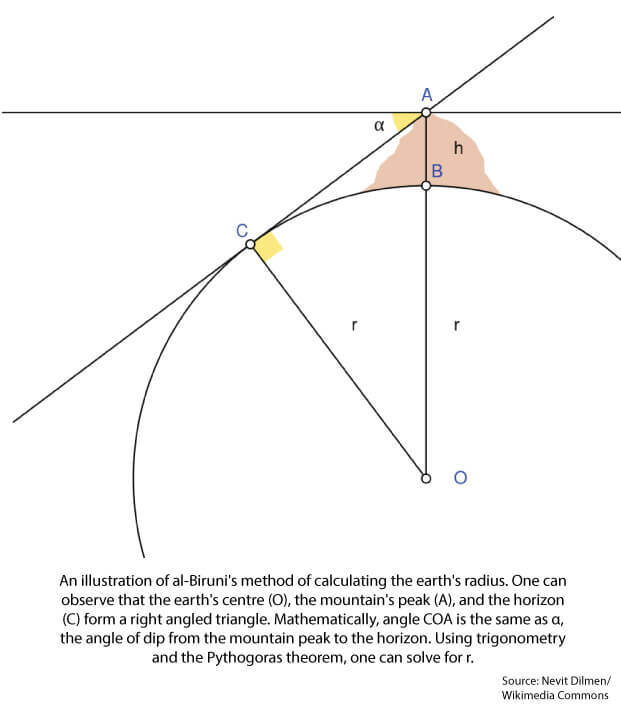 Using trigonometry, he calculated the height of a mountain (in present-day Pakistan) by observing the peak from two different points on the plain. He then calculated the angle of dip from the peak to the horizon using an angle measuring instrument. He used these values to find the radius of the earth as the horizon, the mountain’s summit and the earth’s centre form a right-angled triangle. His estimate was ~6,340km, an error of 16.8km when compared to the modern value of 6,356.8km (polar radius). Mysteriously, his error is 0.26%, which is in the same league as Aryabhata’s error. Could this have been his method? I then turned to Columbus once again, for inspiration. On his fourth voyage, he found himself in distressing circumstances, having beached his two caravels in Jamaica in 1503. The natives initially welcomed the castaways and fed them for a few months, but his sailors cheated and stole food from them. Faced with dire consequences due to the ensuing hostilities, he found himself armed with Regiomontanus’s almanac. He then used the prior knowledge of a lunar eclipse in 1504 (corrected for his time zone, of course) to threaten the natives and restore food supplies, until a relief caravel arrived from Spain. A lunar eclipse varies from a solar one in many ways: the apparent sizes of the sun and the moon as observed from the earth are roughly similar. Hence, when the moon comes in the sun’s path (as seen on the earth), we observe the moon just about completely engulfing the sun during a total eclipse. For any given solar eclipse, the locations where totality is observed fall on a narrow band on the earth, that too for a short while (for a maximum of about seven and half minutes). However, from the moon’s perspective, the earth casts a far larger shadow (rather than just about covering the sun). Therefore, a total lunar eclipse is usually much longer (in hours) and totality can be viewed from almost half the earth. Just as Columbus utilized this knowledge to his benefit, could Aryabhata have followed suit to calculate the earth’s size? Thankfully, some clues can be gleaned from Nasa’s catalogue of eclipses. Crucially, the catalogue notes that around Aryabhata’s time (before the widely accepted epoch of the Aryabhatiya, 499 AD), three total lunar eclipses were observed from the Indian subcontinent: July 492, May 495 and November 495, all three in totality for more than an hour and half. Could he have keenly observed the progression of the earth’s shadow to come up with the answer? In my pursuit for more information, I spoke to B.S. Shylaja, the director of the Jawaharlal Nehru Planetarium in Bengaluru. An experimental astrophysicist by training, Shylaja has authored several popular science books and scholarly papers on astronomy. “Yes, eclipses were the only tools earlier navigators and astronomers had for establishing the longitude at sea. Unfortunately, there were serious errors. If you see the maps prior to say 15th century, they look horribly distorted; the Indian astronomers were no exception. They kept an elaborate record of daily observations of shadow lengths, angles between heavenly bodies and applied these to the formulae they knew. They always expressed the timings of the eclipses in terms of the shadow length of the gnomon (the part of a sundial that casts the shadow) and applied a correction for longitude called deshantara. Things only changed with discovery of Galilean moons,” she said, referring to Galileo’s scientific proposal to calculate the longitude. I was intrigued. In my quest to understand Aryabhata’s methods, I got in touch with K. Ramasubramanian, a professor at IIT Bombay who is an authority on the subject and has written several books on the contributions of Indian astronomers over the ages. He also teaches a popular course on Indian mathematics (one of the video lectures can be found here). He gives valuable insight regarding measuring instruments and how Aryabhata could have achieved the accuracy of the values obtained. Expectantly, I proceeded to quiz him regarding Aryabhata’s method, to which he replied, “Indian astronomers were quite familiar with the concept of longitude. They had the concept of deshantara—basically a correction for the local time at a longitude, calculated from the distance to a reference location, which was Ujjain. Since they could have determined the latitude easily using shadow lengths of a gnomon at noon, my guess is that they used it to mark points on the earth at equal latitude and measured the distance between them.” Voila! In the spirit of Columbus, I had sailed west when my answer lay in the east; like the trekkers at the start of the story, I had now found the way to get off al-Biruni’s mountain. I had looked at the darkened edge of the moon when, in fact, the answer was at the height of noon. 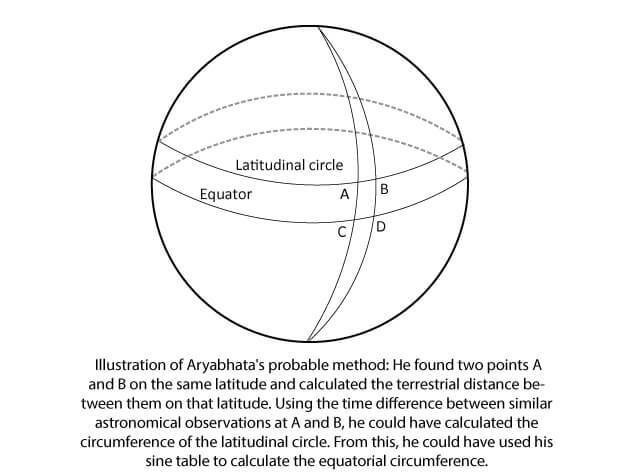 Aryabhata perhaps identified two different locations on the same latitude by monitoring shadow lengths at noon (using a gnomon) and then proceeded to calculate the difference in time (by observing the moon’s position or using a water clock) and terrestrial distance between these two locations. Since each degree of longitude corresponds to four minutes, the terrestrial distance of 1° longitude multiplied by 360 would yield the earth’s circumference at that latitude. Since Aryabhata lived in India (north of the equator), he would have calculated the value alright, but it wouldn’t have been a great circle. This might not have been a limitation in his case as Aryabhata was quite conversant in trigonometry (as an aside, he had, in fact, computed an accurate table of sines), which he could have used to calculate the equatorial circumference of the earth. While he was observing rays at different times, this is a case of making hay while the sun shines.